Frode Gjerstad, clarinets, saxophone; Nick Stephens, double bass; Paul Hession, drums. 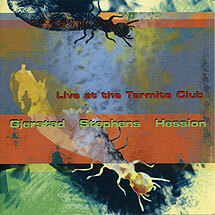 Recorded live at the Termite Club, The Adelphi, Leeds in September 2003. Cover artwork (reproduced above) by Fay Stephens.